Ace of Spades: Oorlogschip c1642. A warship of the Dutch Navy with 50 gunports. Reverse: Kruiser De Ruyter 1936. She was a Light Cruiser of 6,500 tons of the Dutch Navy. She was in service until 1942 when she was sunk by a torpedo at the Battle of the Java Sea. Her ship’s bell was recovered and is displayed in the Kloosterkirk in The Hague. Ace of Diamonds: Walvischvaarder c1700. A whaling ship. Since 1982 the International Whaling Commission has placed a moratorium on whaling. Japan, Iceland, Norway and Russia oppose this but Japan, Iceland and Norway are still catching whales. Reverse: Stoomtrawler 1938. A steam trawler. Ace of Clubs: Beurtman c1700. A coastal barge. Reverse: Rijnaak 1935. A high capacity barge. At the end of their useful lives a lot of these barges were converted into accommodation. In fact you can still stay in a barge hotel on the river Amstel in Amsterdam today. Ace of Hearts: Koopvaarder c1600. This was a Dutch armed merchantman, usually 3-masted, used by the Dutch East India Company. It has 10 gunports. Reverse: New Amsterdam 1938. This liner of 36.000 tons was in service until 1973 and was nicknamed “The Darling of the Dutch”. She was one of the very few Trans Atlantic liners still operating after jet aircraft took over most of the traffic. 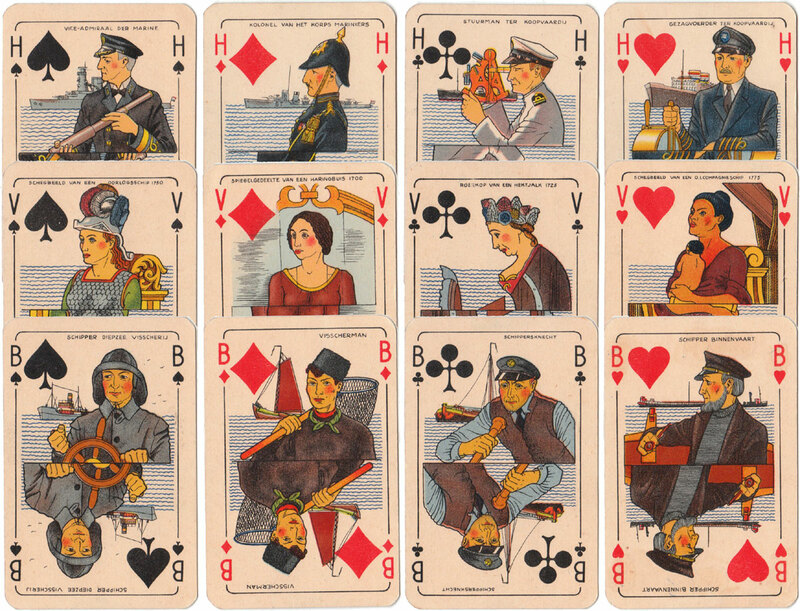 Above: Dutch Maritime pack designed by J.Verhoeven and printed by Speelkaartenfabriek Nederland c1938. Images courtesy Rex Pitts. Jack of Diamonds: A fisherman. As he is carrying a landing net he may well have been using a line to catch his fish. Queen of Clubs: This is a small type of figurehead, usually just a head like a bust, mounted at the rear of the vessel at the rudder station. This one is on an old fashioned kind of barge which literally translates as fence barge. Queen of Hearts: Figurehead of an East India Company ship 1775. The Dutch East India Company was founded in 1602 and lasted until 1799. It was originally granted a charter by the Dutch government to exploit the spice trade. It became huge with a fleet approaching 5,000 ships and employing a million Europeans in the course of its trading. 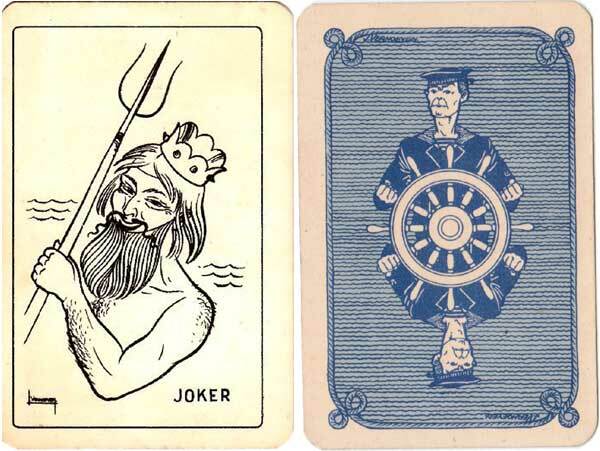 Above: Neptune is the Joker.